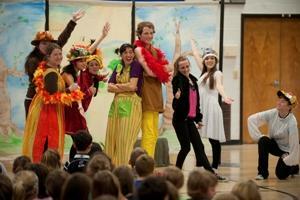 The cast of "The Tale of Rollie Robin" pictured during their recent performance. College courses are often filled with lengthy lectures and even longer term papers — rarely do students dress up in funny costumes and put on a play to teach elementary schoolers about healthy habits. A group of students from the University of New Hampshire recently did just that, when they put on the play “The Tale of Rollie Robin” at a local elementary school. The play, based on a story book that is part of a childhood obesity awareness program, tells the story of a bird named Rollie Robin, who has trouble flying because he isn’t eating healthy food or getting enough exercise. Rollie Robin is the brainchild of UNH’s William Scott, a professor of applied business management. After his daughter was diagnosed with asthma, Scott created the “Samantha Skunk Smoking Prevention Program” to teach elementary school kids about the dangers of tobacco. When the problem of childhood obesity entered the national stage, Scott used the same type of formula to teach young people healthy eating and exercise habits. Along with the storybook, the Rollie Robin program is designed to teach kids to make healthy choices every day. Rollie teaches components such as the importance of eating a healthy breakfast and the 5-2-1-0 concept, which urges youngsters to eat five fruits or vegetables daily, engage in two hours or less of screen time, take part in one hour or more of exercise and drink no sugary beverages. During the program, students also are urged to keep a journal of their choices, earning points for making healthy ones (and helping their siblings and parents do the same). Meanwhile, the class helps Rollie fly to his summer home via a 12 foot banner hung on the classroom wall — Rollie makes progress on his journey as the class logs healthy habits. Scott worked with Raina Ames, an associate professor of theater and dance at UNH, to bring Rollie Robin to life in a way that the book itself might not be able to do. Creating the play also gave Ames the opportunity to give her own students practical experience at crafting educational theater. “Ames loved the idea of having her students learn by doing,” Scott says. Scott adds that he hopes that the Rollie Robin will become a theater production that can be put on by small companies or youth organizations to help spread the little bird’s healthy message.